Submitted by Jeff Buster on Wed, 11/10/2010 - 17:33. When replacing a double hung cast iron counter weighted window recently I had occasion to open up the exterior wall in an area where I had previously installed blown-in cellulose insulation. Because the new window was larger than the old window a longer header was necessary so I had to cut open the stud cavity next to the existing window. The frame of the old window is at the lower right hand of the image. The new 2x4 stud on the left hand side is screwed to the plaster wall to act as a guide for the saw to cut the lathe. 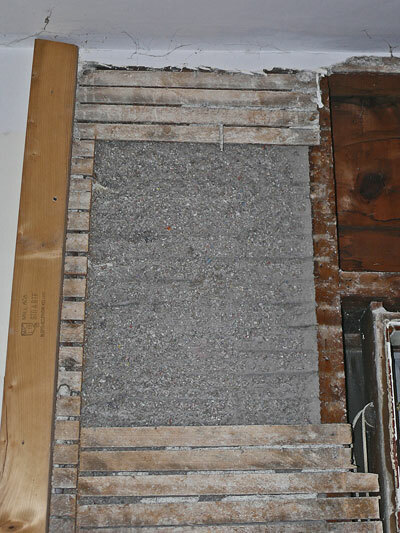 The image shows how completely and compactly the blown-in gray cellulose insulation filled the 4 inch thick void between the outer wall sheathing and the inner wall lathe and plaster. There are very few jobs I have done that when I completed them, and I looked back at them, that I couldn’t see a way to have improved the job. When the wall was opened up on this job I was very impressed with the extremely thorough and even placement of the blown in insulation. The placement isn’t the result of any particular expertise, but because of the blown-in method. With the blown-in method of insulating a wall, a 4 inch diameter hose is connected to a blower/insulation feeder. One manufacturer of blowers is Air Force. You can see the blue machine on Google images here. Because there is a large volume of air blown into the wall cavity along with the air entrained cellulose, the cavity becomes slightly pressurized. Every air “leak” in the cavity is plugged as cellulose is pushed to the leak. Unlike insulating with fiberglass bats, the blown-in cellulose fiber void filling process is self – perfecting. The very fine dust in the cellulose is pushed by the pressurized air flow into the smallest cracks in the exterior wood sheathing and in the plaster. The result is an insulated wall cavity with no insulation voids and very little through wall air leakage. If you are interested in learning more about how to insulate a house from the inside this article by Bill Van der Meer will be helpful. Submitted by noner on Thu, 03/24/2011 - 20:43. Submitted by westward on Fri, 11/12/2010 - 20:31. The van der meer article answered some of my questions that the insulation guys weren't interested in dealing with, particularly why one would drill through old plaster to blow in insulation when the exterior wood trim is easier to plug. Having done a lot of plaster work on my own when I bought the house, I was not happy with letting people drill 4" holes into the walls. Turns out that we did not need this, as the cellulose we had blown in 20 years ago is still doing its' job well. Besides the obvious energy conservation benefits, the deadening of outside noise was the first thing that I noticed. Flame retardants added to the cellulose also gives a little extra benefit. When one thinks of a balloon frame, open spaces between studs, with plaster on one side and exterior trim on the other, it just makes sense to fill the void. I now have blown in foam on the interior of the old brick foundation. I am pleasantly surprised in 1) the lack of chemical odor and 2) the effectiveness of dealing out draft. The toes might be toasty for the first winter in many years.